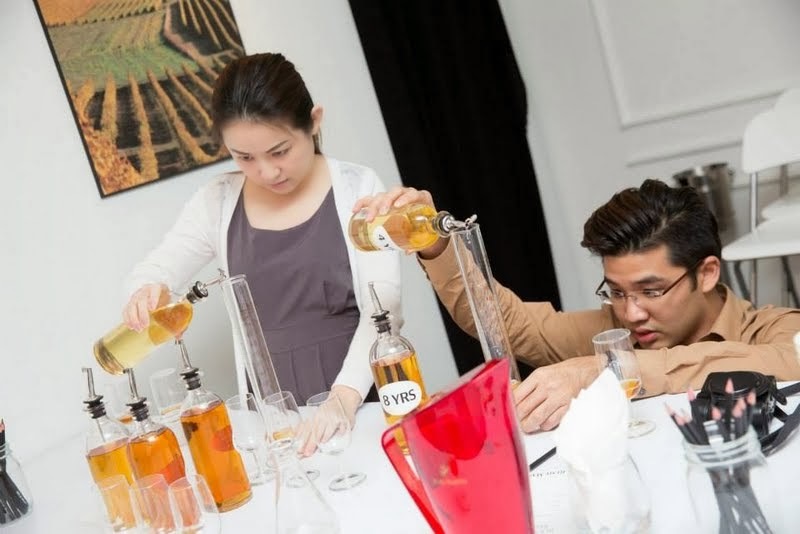 The Heart of Cognac Experience debuts in Malaysia! Going luxe, my next excursion had me experiencing a cognac experience the Rémy Martin way. Hundreds of distinguished guests, media, industry players and discerning tastemakers are invited by the House of Rémy Martin to experience ‘The Heart of Cognac Experience’ held at Maison Francaise recently. Rémy Martin, French winemaker, founded his exquisite cognac business in 1724. Specializing in Cognac Fine Champagne, its cognac products are all aged between 10 and 37 years. In fact, it is the only company that utilizes the highly prized and rare grapes from the most respected regions of Grand and Petite Champagne in the Cognac region. Through this exclusive experience, we explored the craftsmanship and dedication the House of Rémy Martin goes through to produce the elite of cognacs of the world. Choi Yen, Xiang and I arrived a little early and happily took a quick peak at the amazing cognacs under Rémy Martin. Each Rémy Martin cognac held its own grandeur from the Rémy Martin V.S.O.P to XO Excellence to the most expensive and rare Louis XIII. There is even a limited edition of Rémy Martin V.S.O.P featuring Jolin Tsai. The priciest of the lot is Louis XIII, a staggering RM8,600 for a bottle. 100% Grande Champagne, we were told that it took a 4th generation cellar master to blend up from 1200 Eaux de vie that is almost up to a 100 years old. While waiting for our cognac experience, we hang out to taste Rémy Martin inspired cocktails. As we sipped Rémy Cucumber, Centaur Spice and Rémy Kaffir, we caught up with friends and of course watch our bartender whipped up these cocktails. My favorite has to be the Rémy Cucumber, utterly refreshing and fabulous. More on the sweeter end, the cocktail has found its match of pairing cucumber with Rémy Martin cognac beautifully. Made from Rémy Martin V.S.O.P., cucumber syrup, apple juice and lime juice, I had two delicious glass of this one! Centaur Spice had Rémy Martin V.S.O.P. with ginger ale and angostura bitters while Rémy Kaffir was made from Rémy Martin V.S.O.P., kaffir lime, grapes, lemon and ginger beer. We were ushered in a room with a beautiful wall of eaux de vies featuring from 5 years to 20 years. Once in, we were greeted by the Rémy Martin Brand Ambassador, Brandon. He proceeds to enhance our knowledge with the history and the process on how Rémy Martin cognacs are made. Distilled thrice, the complex process is then finished and left to age from a minimum of 10 years before they are bottled and sold. We get to play and experiment on how to get the perfect blend for Rémy Martin V.S.O.P. from our 4 year old, 8 year old and 14 year old eaux de vies. I had my blend of 40ml of 8 year old, 4 ml of 4 year old and 6 ml of 14 year old tested by Brandon and was told I am a little off. The correct blend should be 35ml of 8 year old, 10ml of 4 year old and 5ml of 14 year old. Oh well, this was certainly an experience. I even learnt to experience the cognac by taste, sight and aroma. Choi Yen and Xiang too took on the challenge for the blend. We proceeded to move into another room replicated after a Rémy Martin’s cellar. It is here that we got our taste of Rémy Martin XO Excellence and Rémy Martin Club. While the Rémy Martin Club is intense in flavor, the Rémy Martin XO Excellence shows off more finesse with its velvety and rich finish. We were told that once the cognac is bottled, it stops its ageing process and under certain controlled environment, the cognacs may literally last for a very long time. Brandon also gave us a demonstration on how cognac is extracted from its barrel. With the evening concluded, I went home armed with more knowledge about Rémy Martin cognac and its history. It takes time to and classical methods to produce a grand cognac and the House of Rémy Martin continues to respect their distilling traditions to this day. 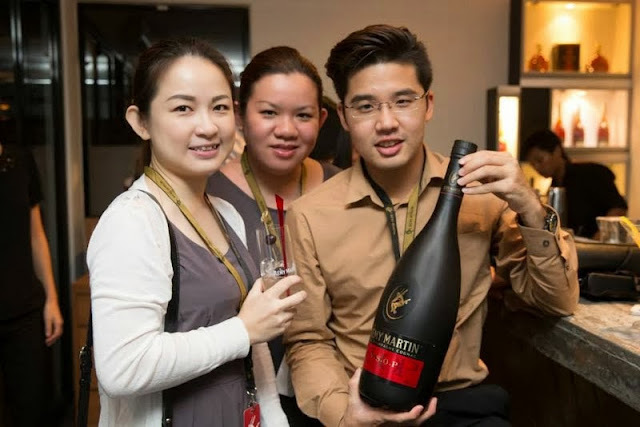 For the latest news on the House of Rémy Martin, follow www.facebook.com/RemyMartinMalaysia. My friend was running this event! I stopped by for a bit on, I think Wednesday, guess that wasn't the day you went. I'm slowly learning to appreciate cognac. For now the cocktails are the most exciting. An eye opener experience for me! Like Choi Yen said, is an eye opener experience!